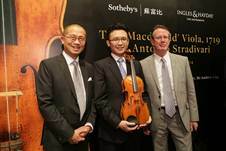 [4 April 2014, Hong Kong] The Hong Kong Philharmonic Orchestra’s Principal Viola, Andrew Ling, has been chosen to play the legendary ‘MacDonald’ Viola made by Antonio Stradivari in Hong Kong on 4 April 2014, the only Asian stop among the New York, Paris and HK Sotheby’s travelling exhibitions during its Spring sales series. Stradivari’s name has been a synonym of perfection in the field of musical instruments. 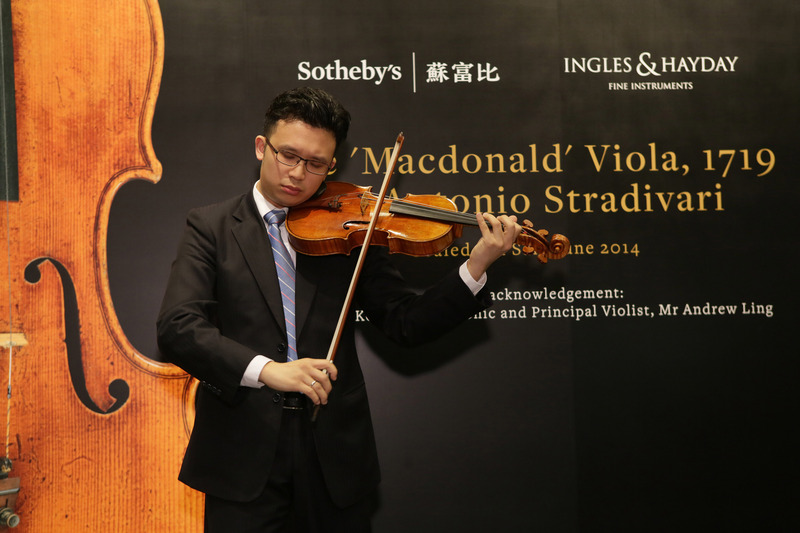 The ‘MacDonald’ Viola, made in 1719, is one of the two violas made during Stradivari’s golden period and is one of the few finest violas in existence. It was purchased by Godfrey Bosville, the 3rd Baron MacDonald – from whom its name derives – in the 1820s. The Viola was last owned and played by Peter Schidlof, violist of the Amadeus Quartet based in London until he died in 1987. The instrument has then been locked in a safe for 27 years until being offered for sale by the family of the late musician. A native of Hong Kong, Andrew Ling attended Indiana University, where he completed his undergraduate studies with Henryk Kowalski, and his graduate studies at Indiana University with Mauricio Fuks. He then studied with Cho-Liang Lin at Rice University in Houston. 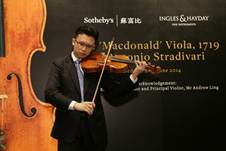 Ling began studying the violin at the age of six under the tutelage of the late Professor Lin Yao-ji of the Central Conservatory of Music, Beijing. As a child, he toured Europe, North America and the Asia-Pacific region performing extensively throughout these regions with the Hong Kong Yip's Children's Choir as its resident violin soloist, as well as appearing regularly as a soloist with the Pan Asia Symphony Orchestra. His latest performance last year saw him playing Walton’s Viola Concerto under the baton of international award winning conductor, Jimmy Tsang to critical acclaim. He has also collaborated with the Hong Kong Chinese Orchestra and the China Film Philharmonic Orchestra, and has given recitals in Hong Kong, the United States and Austria. The Hong Kong Philharmonic Orchestra is the city’s largest and busiest musical organisation and is a vital part of Hong Kong’s cultural life. This season it celebrates its 40th professional season, but its roots stretch back well over a century. The HK Phil has now evolved into an orchestral powerhouse in the region, and an acclaimed cultural centrepiece of Asia’s World City. The HK Phil is formed on the belief that a great city deserves a great orchestra. Annually it presents over 150 concerts attracting over 200,000 music lovers. Featuring an enviable roster of international conductors and soloists, the HK Phil performs a broad variety of music, with many concerts presented free; among them the annual Swire Symphony Under The Stars. Through its acclaimed education programme, over 40,000 young people learned about orchestral music in the last year. The Swire Group Charitable Trust has been the Principal Patron of the HK Phil since 2006. Swire’s enlightened support, the most generous in the orchestra’s history, continues to enable the orchestra to reach towards high artistic goals. The HK Phil’s members come from every corner of the globe, with a strong core of Hong Kong musicians. In September 2012 Jaap van Zweden became the orchestra’s Music Director. Future years will see an ambitious series of new projects, with major international tours, renewed local partnerships, and large-scale concert events. The HK Phil has commenced a multi-CD recording project for Naxos, featuring works by Chinese composers.